Our Commitment to Sustainability is earning RECOGNITION AND HONORS from notable sources. EPA is part of the Winning on Reducing Food Waste Initiative, a collaboration among EPA, the U.S. Department of Agriculture, and the Food and Drug Administration, to reduce food loss and waste through combined federal action. Over 1,000 businesses, governments, and organizations participate in EPA’s Food Recovery Challenge. Food waste is the single largest type of waste thrown away each year in our daily trash. The strategies used by FRC organizations, plus those implemented by individuals, communities and public-private partnerships help to lessen these impacts and bring the United States closer to meeting the national goal to reduce food waste by 50 percent by the year 2030. The annual NACUBO Awards recognize institutional success in various areas. The Excellence in Sustainability Award is earned by institutions that have demonstrated excellence and innovation in sustainability leadership, including financial, facilities, operational, environmental, community and climate. UTA was one of three universities earning the award this year. UCLA and the University of Minnesota were the other two honored. UT Arlington is a partners of the EPA Green Power Program, and submit data annually for the energy generation from the Solar Panels on the parking garage. The University of Texas at Arlington is one of several organizations involved with Air North Texas, a regional air quality partnership and general public outreach effort. Air North Texas leverages existing resources and program strengths to offer the public a comprehensive resource for air quality information. Collaborative efforts focus on reducing harmful emissions, protecting public health and welfare, motivating residents to make choices that improve air quality and preserving the economic vitality in the region. For the third year in a row, The University of Texas at Arlington (UTA), was honored for outstanding partner involvement for coordinating partner attendance at campus events and helping to recruit a new Air North Texas partner, The University of Texas Southwestern Medical Center. UTA has also collaborated with other Air North Texas partners to implement projects aimed at improving air quality, such as the Metro Arlington Xpress bus service. The EPA’s Food Recovery Challenge program gave its Award for Leadership UT Arlington’s Office of Sustainability. UT Arlington was one of 50 colleges and universities in the U.S. and among the first to join the Food Recovery Challenge, a food waste reduction initiative that is part of the EPA’s WasteWise program. Participants are asked to pledge to make a 5 percent reduction in food waste over five years through prevention, donation or composting. The North Texas Commission recognizes organizations in the region that demonstrate outstanding efforts to improve local air quality. More than 25 organizations representing over 75,000 employees in the North Texas region applied for the award this year. UT Arlington received the award for Best Community Impact in the Working for Clean Air Awards presented by the North Texas Commission last week at the Irving Convention Center in Las Colinas. UT Arlington’s case study on Environmental Management Systems is included among Campus Ecology’s Best of 2012 resources by the National Wildlife Federation. The study is one of 112 selected that features the best green projects from colleges and universities across the nation. NWF’s Campus Ecology program works with several hundred campuses nationwide each year on efforts to advance student leadership, reduce carbon pollution, and support career education. The UT Arlington Campus Sustainability study on Environmental Management Systems is a methodical approach to minimize adverse environmental impacts, maintain regulatory compliance, promote sustainability, and encourage safe work practices. Improving air quality in North Texas requires consistent, innovative efforts throughout the year, and the Air North Texas partners recognized by the Regional Transportation Council on Nov. 8 demonstrated this through outstanding contributions to Air North Texas, the regional clean air campaign. The University of Texas at Arlington was the first-ever recipient of the outstanding partner involvement award, a new category of recognition. The UT Arlington Department of Communication and Air North Texas partnered to develop a video about the importance of air quality and collaborated on numerous campus events as well as presentation opportunities to graduate classes. The announcement acknowledges UT Arlington’s commitment to sustainability as an integral part of College Park District, an entertainment, living and shopping development spanning more than 20 acres that is helping revitalize downtown Arlington. The Green at College Park opened in March 2011 and includes 2.6 acres southeast of College Park Center, the new 7,000-seat special events venue. Through specialized soil, native plants and innovative design concepts, the park helps reduce storm water runoff from College Park Center by more than 25 percent. It filters 80 percent of the suspended solids out of the water before it flows toward flood-prone Johnson Creek. The Green also contains several recycled features, such as a walkway made from recycled beer bottles and large shade structures made from recycled metal. UT Arlington recently joined the U.S. Environmental Protection Agency (EPA) as a Green Power Partner. Our commitment as a Green Power Partner, helps to reduce the risks associated with climate change by supporting technologies that are more sustainable for businesses and communities. The Green Power Partnership is a voluntary program that supports the organizational procurement of green power by offering expert advice, technical support, tools and resources. The partnership was awarded for the purchase of Renewable Energy Credits (REC’s) towards the LEED certification of the 234,000 square foot, state-of-the-art Engineering Research Building. The North Texas Clean Air Coalition has announced the recipients of the Working for Clean Air™ Awards. The awards program is in its seventh year of recognizing North Texas’ outstanding workplaces for clean air, sustainability, and green initiative. The University of Texas at Arlington received the 2010 Innovative Initiative Employer for the Car Sharing and Ride Sharing Program, Recycling, Composting and Community Gardens, and Office Green Team Program. 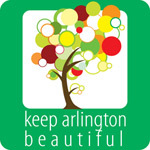 The University of Texas at Arlington earned Outstanding Initiative Award for Educating, Motivating North Texans to Go Green, Breathe Clean through the partnership with Air North Texas. The Air North Texas campaign is coordinated through the North Central Texas Council of Governments (NCTCOG). 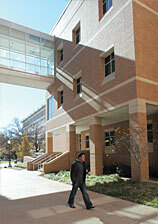 The UT Arlington Library was recognized for putting its sustainable thinking into practice. First, Texas Carpet Recycling recognized UT Arlington for recycling more than 7,700 pounds of broadloom carpeting resulting from renovations on the fourth and fifth floors of the Central Library. Not only will the carpet be recycled into alternative fuel, but Texas Carpet Recycling will also plant one tree per ton of recycled carpet. Second, by purchasing six Canon Energy Star copiers, Canon will donate 60 trees—10 per copier—to the Arbor Day Foundation. The Association for the Advancement of Sustainability in Higher Education (AASHE) released in August 2009 its annual digest of campus sustainability initiatives and developments across the nation, including many at UT Arlington. The green roof project, groundbreaking on the Engineering Research Building, and release of the white paper on curriculum and research are examples of the University’s accomplishments. The National Wildlife Federation’s Campus Ecology program released a report titled “A National Report Card on Sustainability in Higher Education.” UT Arlington was one of 334 institutions nationwide and one of 14 in Texas rated as “exemplary.” Highest marks were on energy efficiency/conservation/renewables and on recycling/solid waste/materials. Read more on the National Wildlife Federation web site.